Union Park Press, 9781934598061, 223pp. Discovering the Boston Harbor Islands is an indispensable resource for those who want to uncover the best kept secret in the Northeast. 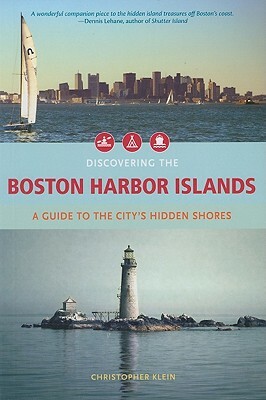 Part history, part travel guide, Christopher Klein has written the most compelling invitation to explore the Boston Harbor Islands national park area to date. Explore the military installations that protected Boston during wartime--including Fort Warren, home of Confederate prisoners during the Civil War. Visit Boston Light on Little Brewster, the nation's oldest lighthouse site. Kayak into the coves where pirates and bootleggers once hid. Dive amid century-old wrecks, or climb to the top of Spectacle Island for an altogether different view of Boston. Take in a jazz concert, an antique baseball game, or simply hop from one island to the next to experience the stunning natural beauty of this most storied national park. Complete with resource listings of recreational activities on and around the harbor islands and richly illustrated with over 150 full-color photographs, Klein's comprehensive coverage and keen wit will inspire thousands of landlubbers and mariners to leave port for many summers to come. Christopher Klein is a writer and author specializing in travel and history. His articles have appeared in magazines, newspapers, and web sites across the United States, including: The Boston Globe, New England Travel, Boston Magazine, National Geographic Traveler, AAA Horizons, and the St. Petersburg Times. His blog, HubTrotter covers travel and history topics in Boston and beyond. Chris lives on the mainland with his wife and son in Waltham, Massachusetts.